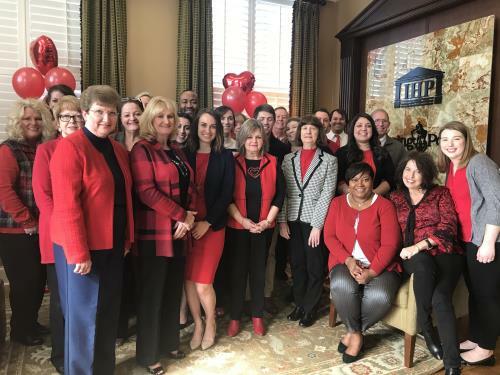 In honor of National Wear Red Day, Independent Healthcare Properties and Morning Pointe Senior Living hosted a heart-healthy luncheon on Friday catered by local eatery Mixed Up Cup of Cambridge Square in Ooltewah. Associates wore red in support of heart-healthy choices and of those living with heart disease. “I am so proud of our associates for standing in solidarity with the millions of women battling heart disease. This is a cause that is especially important to us, as 75% of our Morning Pointe residents and nearly 90% of our associates are women,” said Greg A. Vital, the president and CEO of Morning Pointe Senior Living. Friday’s luncheon marks the beginning of a number of wellness initiatives that Morning Pointe Senior Living residents and associates with celebrate throughout 2019.